ALLENTOWN, PA - The Lehigh Valley IronPigs managed to salvage the final game of their four-game set with the Columbus Clippers Sunday behind the left arm of Greg Smith, who allowed just a run in eight innings en route to a 2-1 victory. 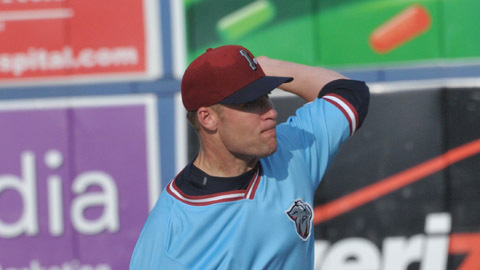 Smith tossed a series high 101 pitches in his eight innings of work, allowing just four hits and an unearned run as the IronPigs snapped a six game losing streak in the finale at Coca-Cola Park. It was the first time Smith tossed eight innings since he did so last July 3 while with Salt Lake. The 101 pitches was his most in an outing this season, blowing away his previous high of 82, which was in his last outing. The southpaw allowed an unearned run in the first inning due to two errors in the field, but allowed almost nothing more thereafter. He set down the side in order in the second, third, fifth, sixth and seventh, and faced little adversity until he had two outs in the eighth inning. Luis Hernandez and Ezequiel Carrera both singled, which prompted a visit from IronPigs' manager Dave Brundage. Lehigh Valley had the righty Zach Miner warmed and ready, but Brundage opted to stick with the lefty. So Smith stayed in to face Ryan Rohlinger, but Carerra stole second to put men on second and third. The IronPigs decided to issue Rohlinger a free pass to load the bases in favor of the lefty matchup with Jeremy Hermida. Hermida had a superb series against Lehigh Valley, with six hits and three runs batted in in the last two games alone, but that did not make Smith shy away from attacking him. "I played the rules of baseball basically," Smith said. "When I go out there I have a lot of things in my favor as the pitcher. I get to dictate to the hitter what I throw, when I throw where I throw it. I have basically what we call the rule of 63. Sixty-three percent of the time he puts it in play he is going to be out, much less if I'm moving the ball in and out, back and forth. So I have an overwhelmingly good scenario in my favor so I'm just going to go after him, right at him." He got ahead with a fastball for a strike and on the next pitch came right back with another and got Hermida to pop up to end the inning. Smith lowered his ERA to a miniscule 1.93 with his eight innings today, but what is more impressive is his ERA as a starter, which dips to just 0.26 (one earned run in 34 1/3 innings). Smith, who has been a starter most of his career, seems to have not only accepted starting again but is thriving in the starter's role. "I'm very, very comfortable with the ins and outs of the routine and I feel good about being able to get my work done in that routine," Smith said. "I just feel more confident going into a start then I do a relief appearance just because I know where my body is I know how my routine was leading up that start." Smith could not have earned his fifth win of the season if it were not for a couple of runs, which have been hard to come by for Lehigh Valley in the series. In the third inning the IronPigs snapped a 16 inning scoreless streak when a triple from Michael Martinez followed by doubles from Cesar Hernandez and Freddy Galvis gave them a two run lead. It was the first time since July 10 in the third inning against Pawtucket that the IronPigs had three extra base hits in an inning. That was all the scoring for Lehigh Valley, but it proved to be more than enough. Miner came in for the ninth and escaped a second and third, one out jam to preserve the win and earn his second save. Lefthander T.J. House suffered the loss for Columbus despite pitching extremely well in the ballgame. He lasted seven innings and allowed two runs on eight hits while striking out seven, but was eventually outdueled by Smith. House drops to 3-10 with a 4.95 ERA this year. Galvis and Hernandez stuck out for Lehigh Valley offensively, as both went 2-for-4 with a double, bunt single and RBI as well contributing with strong play in the field. For Columbus, Chun Chen was 2-for-3 with a double and RBI. With the win the IronPigs snapped their aforementioned six-game losing streak, and are back to .500 at 51-51 before they shoot north to Rochester tomorrow. "It's a happy bus ride, a happy clubhouse after that game and everybody's in a good mood, especially after the way that game ended like that," Smith said. "That's a good high, especially going into the teams were going to be playing right here, so it a very good momentum swing in our favor. The IronPigs series with Rochester will begin Monday when lefty Adam Morgan (1-4, 4.97) makes his return from the disabled list opposite Rochester's Logan Darnell (0-2, 8.22). First pitch is at 7:05 p.m.